In a stream of humanity and hope, the survivors strode proudly down the path of the Healing Garden which had been planted just in their honor. The placards they marched behind told the story of their triumph—one year to 20—the number of birthdays they’ve celebrated since their cancer diagnosis. To the strains of “This is my fight song,” which has become an anthem for cancer survivors around the world, they marched to the cheers of those who have been carrying them through this journey—their friends and family. They came to be heard, to share their journey through the healing of art and to celebrate each of their victories, both small and life altering. The Art of Life festival, held September 27 at Woodward Park, was both a celebration and a new beginning. 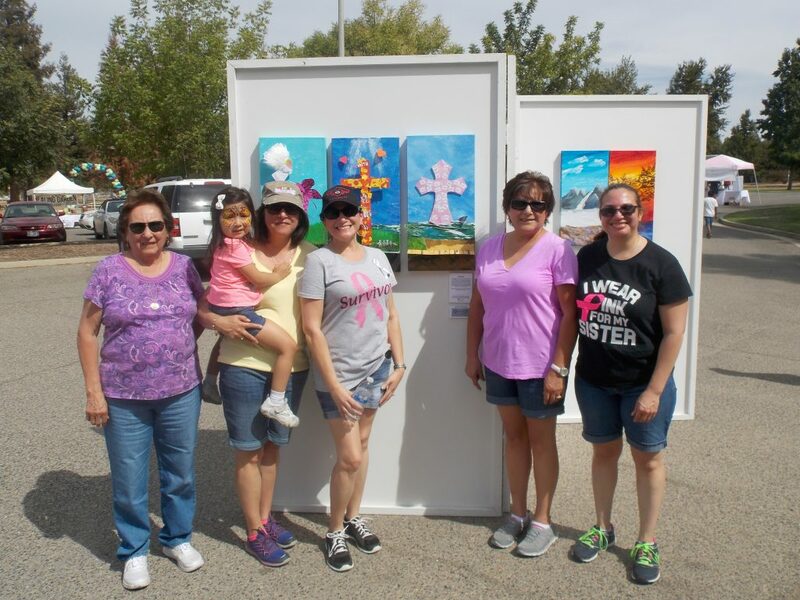 The festival celebrated the Art of Life program, which gives cancer survivors the opportunity to experience the therapeutic aspects of art and creative expression. 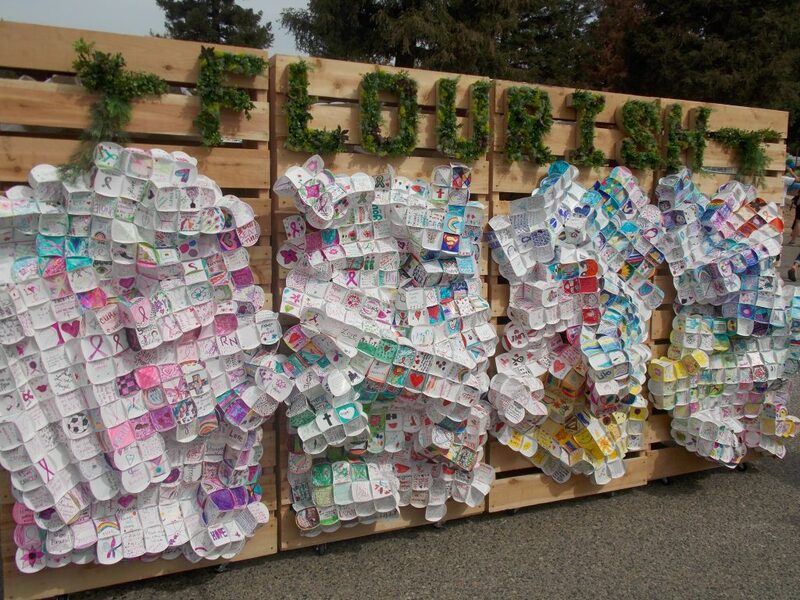 Created and launched in 2007 by Dr. Christopher Perkins, medical director of California Oncology, it has evolved since then to include an alumni project, The Paula Project, a community-wide project spearheaded by the survivors themselves and the Healing Garden at Woodward Park. 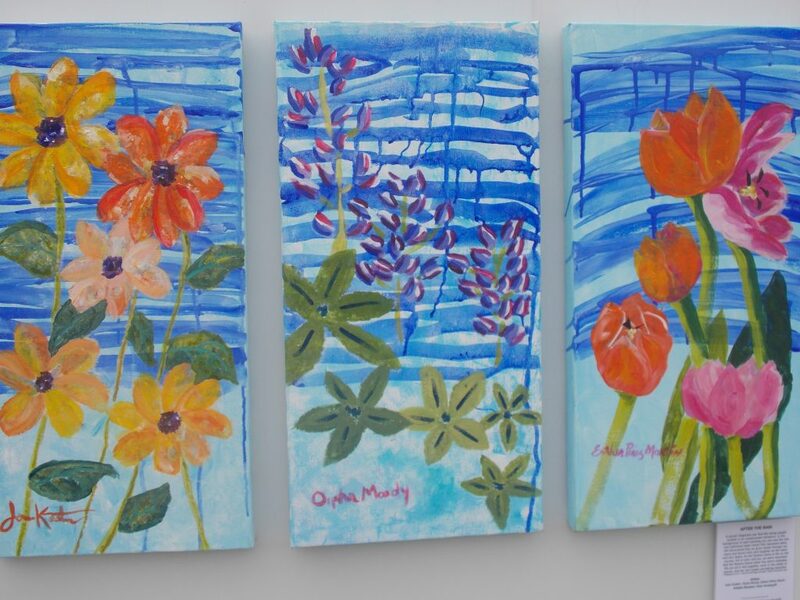 This year’s canvas project, whose theme is “Flourish,” focuses on the personal growth found within the cancer journey and links 71 survivors with 19 local artists to co-create works of art on canvas which represent life in the midst of the cancer journey. The artists, some of whom are also survivors, donate their time and supplies. The Paula Project, named in memory of cancer patient, Paula Doherty, encourages past Art of Life participants to return year after year to continue experiencing the healing arts. The Community Project involves thousands of community members who transform ordinary materials into extraordinary works of art as a testimony of love and support. The festival marked the completion of the first phase of the three-acre garden, developed by the Art of Life Cancer Foundation whose mission is to “inspire people impacted by cancer to connect and heal through creative expression.” The nonprofit foundation, formed in 2014, has raised around $250,000 of its $1 million goal to construct the Healing Garden. With that funding, the foundation has graded and created trails, installed irrigation, planted trees and bought a kiosk to permanently display the art of cancer survivors. A hundred trees were planted along the garden path by the East Fresno Kiwanis organization, in commemoration of its 100th anniversary. With future funding, the Art of Life Foundation plans the installation of a “playscape” for children, more kiosks, an amphitheater, a live lavender labyrinth and benches for reflection areas. The artwork was as varied and unique as its interwoven stories. A pink cross strewn with slivers of names is symbolic of the many friends and large family which has supported survivor Giselda Martin, who was diagnosed with Stage 1 breast cancer four years ago. The art project brought Giselda back to her “dark days” but was ultimately healing. In addition to their own families, many cancer fighters and survivors are bolstered by the clan they’ve created since their diagnosis. Katie Kinosian and Jenna Kieckhaefer have become “sistahs just surviving,” a support group of breast cancer patients. Last year, both Katie and Jenna were diagnosed with breast cancer at age 28. Katie is in remission after extensive treatment while Jenna continues radiation. They held hands as they walked the survivor’s march. 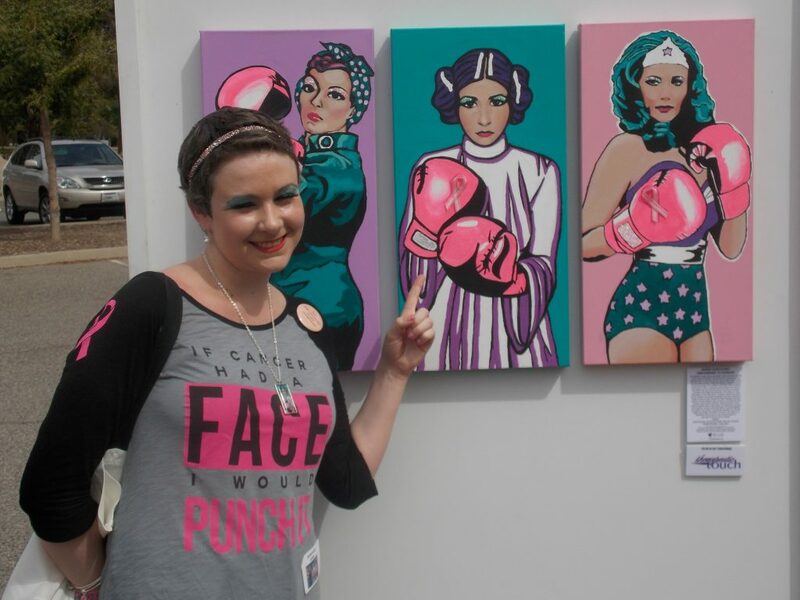 Jenna’s face is featured on her painting of Princess Leia in a trio of heroines on canvas entitled “Super survivors: empowered to survive.” Each of the women, Rosie the Riveter, Princess Leia and Wonder Woman, brandishes pink boxing gloves protecting the side where their breast cancer was found and Jenna has painted her own features on the face of Leia. Katie, who works for her father, Clovis dentist Dr. Donald Kinosian, did a canvas of a night sky entitled “Transitions” at last year’s Art of Life. She has graduated to the Paula Project this year, and created a painted ceramic tile of stars shining through the night sky which will be used in the Healing Garden’s future amphitheater. “When I first started painting the night sky, the painting was all black, but as I continued working on it, it developed more color and life,” she said. The two “sistahs” also joined others in their support group at a September 18 filming of “The Price is Right.” That show, in honor of October’s National Breast Cancer Awareness Month, featured contestants who were all breast cancer survivors and aired Oct. 1. Out of 300 contestants, Katie and fellow Fresno “sistah” Nicole Butler were randomly chosen to compete for prizes. They ultimately went head-to-head in the final showcase with Katie winning it all; a prize package worth more than $48,000 and which included two cars, two vacations and other prizes. Nicole shouldn’t be disappointed, she did win $100,000 cash earlier in the episode. “It was such a great way to end this difficult journey with such a fun experience,” Katie said. Starting with 40 participants seven years ago, the Art of Life project has illuminated the stories of more than 500 survivors, each revealing a journey of darkness and light and indeed offering insight in a very personal way.